I love living so near the beach. I love a good run on the beach. And I really love reading at the beach. Not sure who came up with the the term "beach read" but for me it's a book I can tuck into my bag and read from my spot near the waves. To be fair, I'd also take a beach read to the Koffee Klatch and on a rainy day I'd definitely curl up in my favorite comfy chair with one. For me a beach read is a sort of mini-vacation. I saw a sign the other day that said, "Reading give us a place to go when we have to stay where we are." That's exactly how I see it. 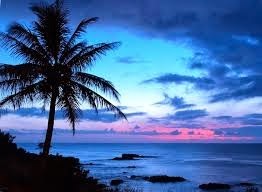 A great book transports me to another place. My favorite beach reads are mysteries. I also enjoy a good legal thriller or a spinetingling suspense, but my go-to read is most often a mystery. Maybe it's my background and my interest in what makes people tick. What your favorite type of book to take to the beach... or to your favorite comfy chair? 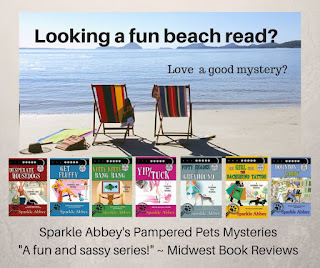 Sparkle Abbey is the pseudonym of two mystery authors (Mary Lee Woods and Anita Carter). 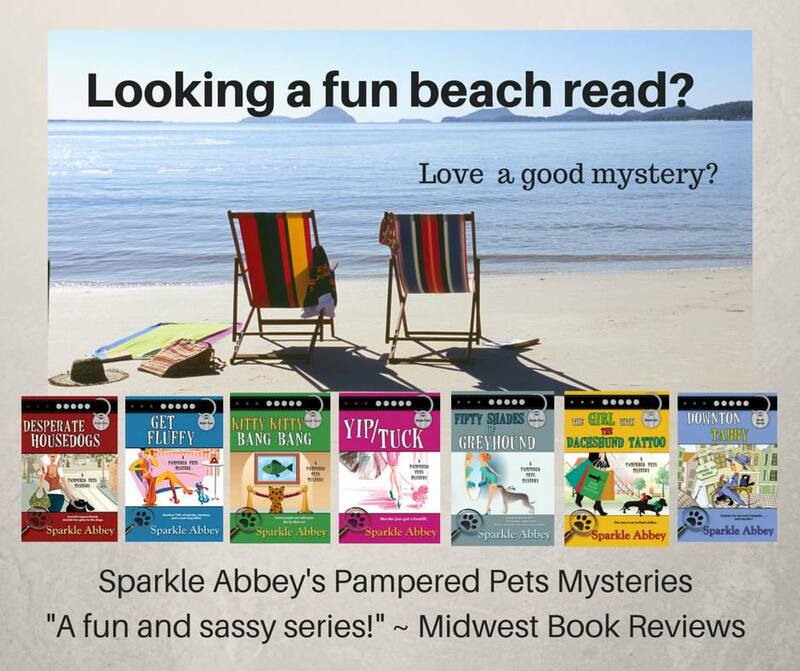 They are friends and neighbors as well as co-writers of the Pampered Pets Mystery Series. The pen name was created by combining the names of their rescue pets--Sparkle (Mary Lee's cat) and Abbey (Anita's dog). Barking with the Stars is their latest book and The Dogfather, their next book, will be out in August. If you want to make sure you're up on all the Sparkle Abbey news, stop by their website and sign up for Sparkle Abbey's Newsletter. My favorite genres of books would be cozy mysteries,Amish stories and sweet romance. Kay - Cozy mysteries are our favorites too. Though, like Caro, sometimes a good suspense works as well. I read pretty much any genre, however, cozy mysteries & urban fantasy are my favorites. I love reading cozy mysteries or romance books. I have a chair in my living room where I love to curl up to read. I love cozy mysteries. I don't live close to the beach but I do have a 55 gallon aquarium I'm my bedroom with fish in it. I can read ,listen to the water running and lay in my bed .